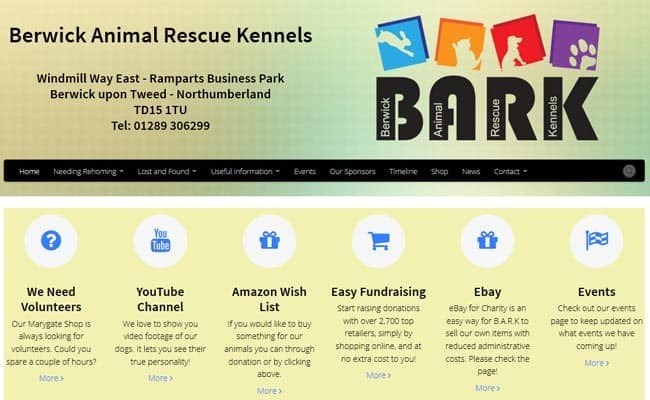 Berwick Animal Rescue Kennels, Berwick-Upon-Tweed – Berwick Animal Rescue Kennels (BARK), is a registered aanimal welfare charity. B.A.R.K provides temporary refuge for unwanted and stray domestic animals. Wherever possible it is our objective to re-home them. Our area of operation is north and south of the Scottish Border, although we will take animals in from all areas, in reality this generally means within about 60 miles of the kennels, although we have had animals in from as far North as Aberdeen and as far South as London.